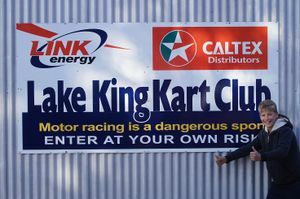 Karting WA South East Zone Championships… Lake King Kart Club. 5th and 6th August 2017. 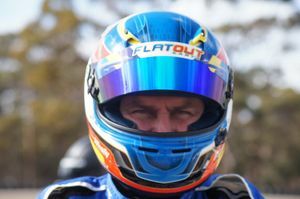 After struggling with set up on Thursday, James Micucci-Allen qualified 4th with Lachy Marshall doing a great job and taking pole. Micucci-Allen was able to get the small issues he had sorted by heat one and he took the lead early finishing in that place after the 12 laps. 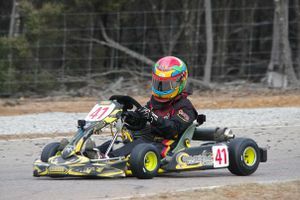 He and Judd Stevens and Joshua Burn had a great tussle in the early laps of each heat. 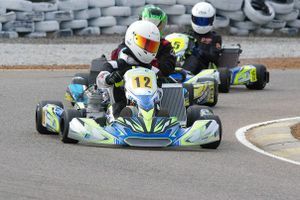 But as the laps counted down in heat two, three and the final, Stephens and Byrne were bogged down with their own battles and Micucci-Allen was able to skip away. The final was a slightly different story as the gap between first and the minor placings was quite big from the outset. A tweak in the rear end of the number 41 Omega was all that was needed. 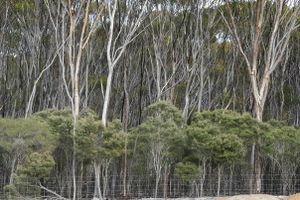 The overall series winner Lachy Marshall was content to stay in the background, all he had to do was stay in the top five over the weekend and he would secure the series win. He did the very well and took home the plate and the big trophy. Keb Evans dominated this class from the outset. 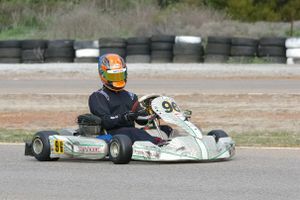 No-one could do anything about the OTK mounted # 96 Kart and driver. Terrence Flynn-Dowell, Spencer Stone and Brad Nock all did their best, but to no avail. A DNF to Nock in the pre-final after some wheel alignment adjustments prior to the race put paid to the attempt to better Evans. 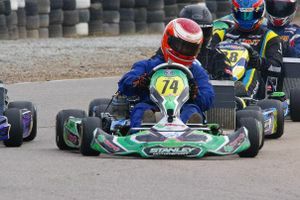 But the week-end really belonged to Hounsfield with pole position, but not by much over Tim White. He was able to win the first heat by a handy margin. Liam Florrisson got closer to him in the second heat as White fell back to third. Hounsfield was able to re-establish his speed over the third heat and win comfortably. The final was a slightly different story with a fantastic last few laps; Tim White was able to outlast Hounsfield over the longer distance to win his only heat of the week-end. 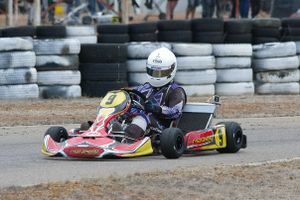 Lachy Clee was the dominant driver in this class over the week-end and he won three of the four heats. 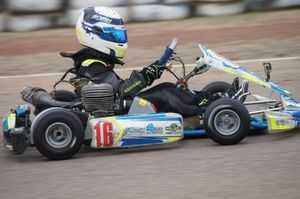 It was the second heat which was one of the favourite races of the week-end when his younger brother Jordon stole the show with a second place. A huge smile broke over his face as the helmet came off on the in grid. The wonderful thing about the result was that he his is still on his “P” plates. 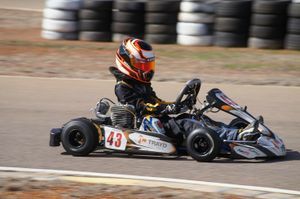 Corey Fraser also had a great race meeting and was able to take out third place for the week-end. 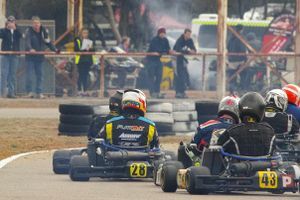 This was only a small class, with Cody Leunan, Bevan Stone, Liam Cain, Jessica Howe, Toby Hobson all having a good dice over the four heats. 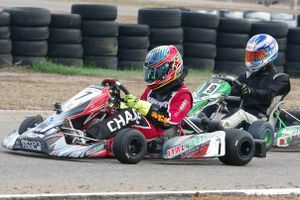 Stone qualified on pole, but Leunan won the four heats. Ethan Trow had a great dice with Lewi Sutherland all week-end and the two were traded positions during the first three heats. 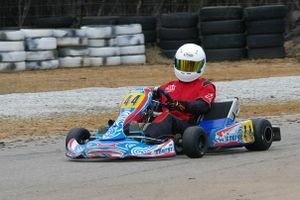 The two Comp Kart drivers were terrific to watch and never traded any paint. 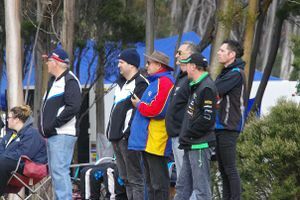 Along with Mark Watts and Courtney Gough they put on a great show through-out the two days racing. Series winner Aaron McGregor had an average week-end, but he knew what he had to do in the end. 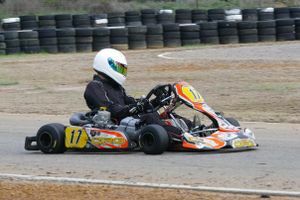 He has won previous series before (so did his dad Lance). But I am sure that when he saw the final points this time he was a little relieved that it was over. 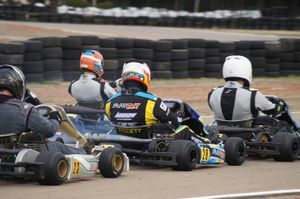 It was a Comp Kart dominated class, with Courtney Gough, fresh from her wonderful effort in the Twin Super (open Performance) in Bunbury a few weeks who made most improvement on this week-end as well. 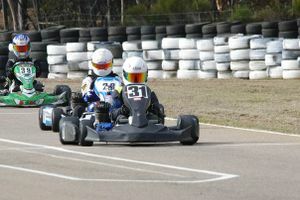 A great second place in the final after a great surge in the final laps almost saw her take out the final. Perhaps the most entertaining final of the week-end, Gough and Trow were quick and clean during the last ten laps. Positions were traded, but it was Trow who prevailed in the end.